Gable Building Corp. is a full service general contracting firm providing our clients a professional approach to building new homes, remodeling and additions. From contract negotiation to completion we are a building company that takes the time to understand our client’s specific lifestyle. Communication is key to the project’s success and we aim to make our client’s visions a reality by making sure their personal style is infused throughout. A truly turn key experience, our small but strong design build team has been critical to the success of many beautiful projects over the years. We assist our clients through each step of the homebuilding experience with guidance and professional advice. We take the time to show different types of materials, layouts and applications in real home settings. Our focus is to stay within budget and complete on schedule. What separates us from many of the builders on the Cape is our transparent approach to pricing. Our clients will be able to see a comprehensive break down of contract prices that leave no room for hidden fees or surprises. We also provide our clients with a detailed project schedule which assists in the visualization of the construction process from start to finish. We are accustomed to “off location” clientele. Many of our clients reside off cape so we rely on current technological communications to get the project done. We understand that weekly site visits are just not feasible. We use a project viewer which allows the client to log in and have an updated look at their project, from anywhere in the world, at any time. Conference calls and online communication are second nature to us during the building process. 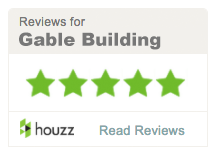 We, at Gable Building, understand the homebuilding process is a team experience. We are committed to working closely with our clients to obtain a relationship that not only lasts throughout the project but well into the future.